Two Reliance employees are back at work following a demanding three day training challenge. Tom Broom, Sales Engineer, and Jack Moore, Manufacturing Engineer, represented Reliance at this year’s Exercise Executive Stretch challenge. Exercise Executive Stretch is an annual event organised by the Volunteer Reserve Forces, who represent all four Armed Forces disciplines – Royal Navy, Royal Marines, Army and Royal Air Force, and the RFCA (Reserve Forces’ & Cadets’ Association). It gives participants the unique opportunity to learn some of the well-recognised and respected leadership skills which the British Armed Forces use. 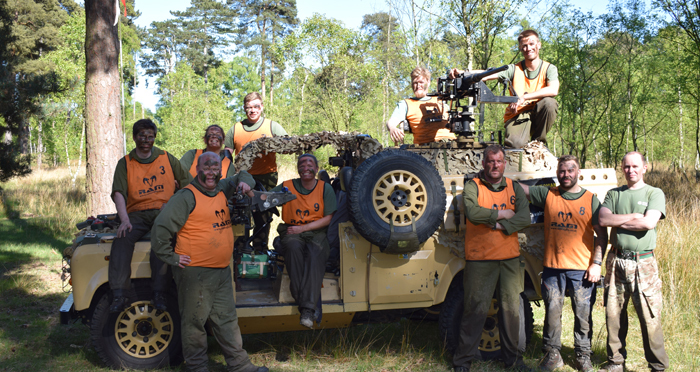 The three day challenge, held at a military training facility in Yorkshire, enables individuals to develop leadership and teamwork skills that can be applied in the workplace, as well as improving self-confidence and enhancing communication skills. Upon arrival at the event, the delegates were split into teams, intentionally chosen to represent a cross section of age, skills, physical ability, etc., and were assigned a mentor, a member of the Reservists. Over the course of the three days, they worked in their teams to tackle a series of leadership challenges, planning exercises and physical activities. These involved problem solving, lateral thinking and initiative, requiring the individuals to call on a whole range of skills and to work effectively as a team. Each task provided an opportunity for the teams to score points based on their performance. The event culminated with the Commander’s Challenge, a three mile run, with a number of obstacles and problem solving challenges along the way. Managers from the organisations taking part were invited to attend to watch their employees in action.